Published on April 26, 2017 in California Builder & Engineer, Daily Dirt and National. Closed Tags: construction, construction industry, contractors, economy, employment, infrastructure, jobs, U.S. Department of Labor, unemployment, Wells Fargo, Wells Fargo Economics Group, Wells Fargo Securities. 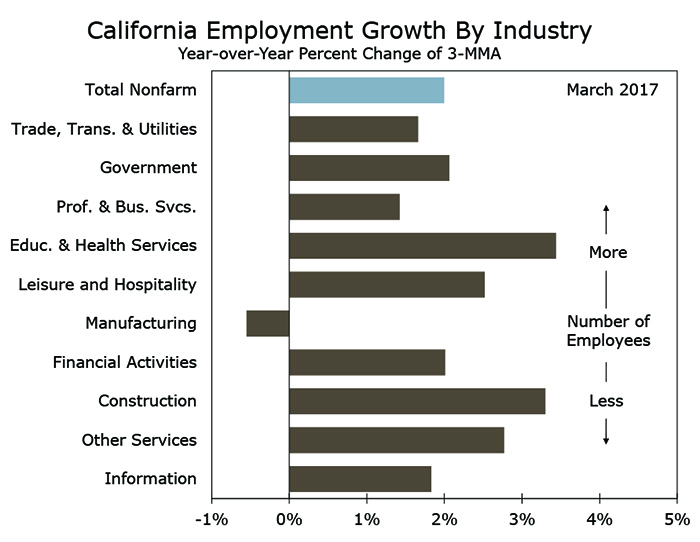 Non farm employment rose solidly across California in March, as employers added 19,300 jobs across the state. The Golden State’s unemployment rate fell 0.1 percentage point to 4.9 percent. California employers continue to hire at a steady, albeit somewhat more modest, clip, with the year-over-year pace of job growth settling in near two percent. The unemployment rate fell 0.1 percentage points to a fresh cycle-low of 4.9 percent, marking its lowest rate since December 2006 (top chart). The labor force and the number of employed Californians grew by 12,100 and 37,100, respectively, while the number of unemployed declined by 25,000 in March. Golden State employers added 19,300 net new jobs in March, pushing up the three-month average to 18,700 jobs. An outsized 18,900 job-gain in construction accounted for the bulk of the increase, and marked the largest one month gain in construction payrolls since 1997. Building activity was likely held back in December and January, as unusually wet weather in California prevented some construction projects from getting started. The drier weather in March likely triggered a larger than usual pick up. Hiring was mixed across most other key industries over the month. Solid job gains were reported in government (+6,300), leisure & hospitality (+4,700) and education & health services (+4,300), while manufacturing posted a more modest increase (+1,700). These gains helped offset job losses in trade, financial activities and professional & business services. 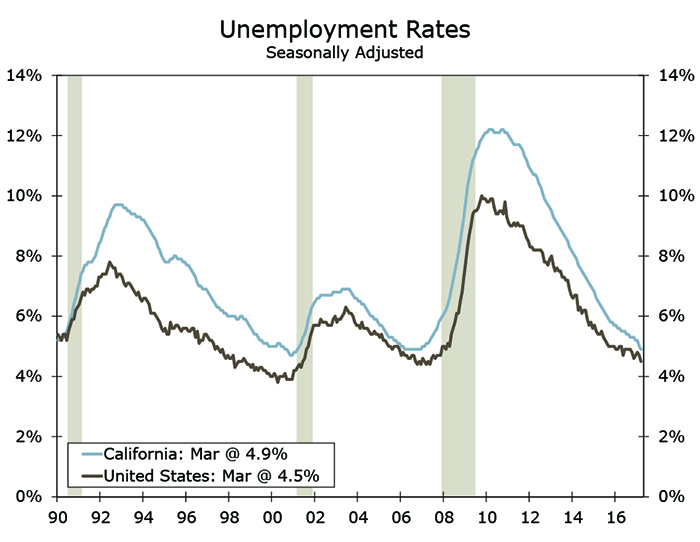 The national employment data were also soft in March, so too much should not be made of this past month’s smaller overall job gains in California. One area that has seen a more prolonged slowing is professional & business services. This industry category captures much of the tech sector and there has been a great deal of anecdotal evidence that hiring has cooled off a bit. If the tech sector is slowing, we believe it is likely due to a combination of factors, some of which may now be reversing. A large proportion of tech sector sales are made overseas and slower global growth and the stronger dollar have likely contributed to some belt tightening over the past year. Fortunately, global growth is once again gaining momentum and the dollar has given back some of its gains, making U.S. tech exports more competitive. The rapid increase in the cost of doing business in California may also be weighing on tech job growth. Firms are increasingly shifting lines of business to lower cost locations in Texas and the Southeast. 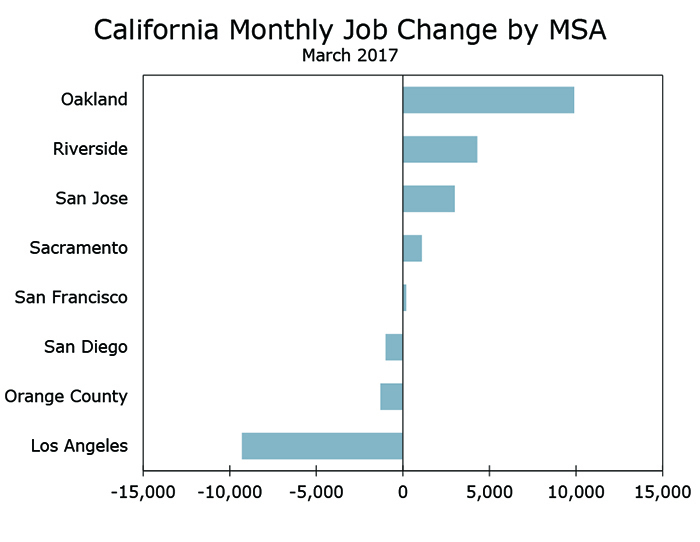 Oakland posted the largest monthly job gain, adding 9,900 positions in March on a seasonally-adjusted basis (bottom chart). Employment in Los Angeles fell by 9,300 jobs in March and Orange County lost 1,300 jobs. Hiring rose in the Inland Empire, however, which added 4,300 jobs. San Diego lost 1,000 jobs in March, while Sacramento added 1,100 jobs. San Francisco added 200 jobs and San Jose added 3,000 positions.